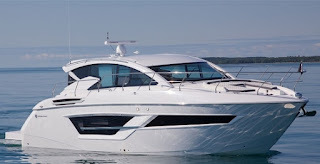 For the 2019 season Cruisers continue to renew its above twelve meters sport cruisers line and presents the new 46 Cantius. The new Cruisers 46 Cantius follows the redesign by Patrizio Facheris of its hard top sport cruisers as started with the 60 Cantius in 2015, to more sporty European looks, without missing a spacious accommodation layout. The Cruisers 46 Cantius presents an interior with a living on the main deck with astern galley layout, while below is two large en-suited cabins with full beam midships owners suite. The Cruisers 46 Cantius is powered by twin Volvo 435hp engines with IPS pod drives which allow for speeds up to 31 knots.